In the words of Jacques Cousteau "People protect what they love," a phrase often quoted in relation to conservation. It may be no surprise to hear that rainforests are being destroyed at a rate of a football pitch-sized area every two seconds. But as rainforests are home to half of all species of land-dwelling plants, animals and insects this is soul destroying news. Biodiversity in the rainforests is more varied than in any other environment and you can find species of virtually any color and size. Rainforest destruction is causing loss of biodiversity and producing devastating habitat loss especially for animals that regularly roam big distances. Due to the rapid destruction of this abundant environment there are thousands of questions we may never know the answers to: is there an undiscovered species of plant holding the secret to an effective treatment for Alzheimer's disease? Is there a rare reptile in an unexplored valley who's venom contains the cure for Parkinson's? Are there unusual undiscovered species of mammal yet to be classified? The unknowns are as soul destroying as the facts. Logging in the Peruvian rainforest is a lucrative industry and timber is a key legitimate export. However, illegal logging is rife, despite the government's attempts to enforce sustainable practices with laws that govern where logging can take place. A report from World Bank in 2012 estimates that 80 percent of Peruvian timber export, mainly mahogany and cedar, is from illegal logging. Peruvian loggers are required by law to show that their timber came from areas where logging is allowed. But the remoteness of the areas where illegal loggers operate mean there are very few patrols to enforce the law. In addition the illegal loggers have found ways of providing the necessary paperwork required by buyers. They may have bought a license from legal loggers and altered the documents to suggest the wood came from from an area where a logging license was granted. Others who have a license for a certain area of the forest, may take wood from outside that area and pretend it comes from the licensed plot. Also there are the inevitable bribes, to people put in place to protect the forest, to turn a blind eye. The types of people involved with illegal logging in Peru range from individuals whose involvement is due to poverty and exploitation, through to highly organized criminal gangs. Most forest crimes go undetected, unreported, or are ignored. Few cases result in punishment and any penalties are usually small, providing no deterrent in light of the huge illicit gains that can be made for stolen forest assets. The President of the Ashéninka indigenous settlement of Saweto, Edwin Chota Valero, has been petitioning the Ucayali regional government in Pucallpa for the last 10 years to gain legal title for Saweto, a 275 square mile region in Peru. Chota saw titling as a fundamental step toward wiping out the epidemic of illegal loggers who are stealing Saweto's forests. A charismatic activist, Chota made it his business to confront illegal logging crews in his pursuit to create an ecological reserve where his people could live sustainably. As his activism intensified, so too did the threats to his life. Chota will never see his dream for Saweto become a reality. He was brutally murdered with three of his community leaders on a jungle trail near the border with Brazil. His community are carrying on his fight against illegal logging and receive regular death threats. Where laws to protect the rainforest and indigenous tribes are not effective is it useful to look at the possible impact on the bigger picture? 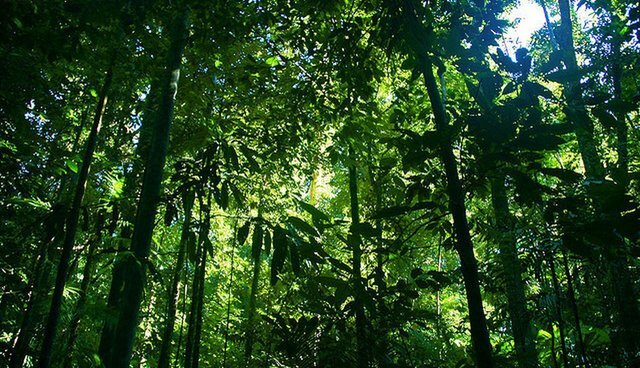 Both forests and oceans are increasingly strained to absorb excess carbon from the atmosphere. In addition we're cutting down rainforests quicker than trees can regrow, which puts extra pressure on the oceans to absorb excess carbon dioxide. This is leading to ocean acidification where carbon dioxide in saltwater leads to an increase in hydrogen ions and a decrease in pH. Increasing acidity is thought to have a range of possibly harmful consequences, such as depressing metabolic rates and immune responses in some marine animals, and causing coral bleaching. Ocean acidification also causes decreasing oxygen levels as it kills off algae. These major ecosystems, both rainforest and ocean, are inextricably connected via the carbon cycle. It's an interesting extrapolation to link the destruction of one ecosystem with the resulting decline of another. But with this in mind, it poses the question of whether strengthening and enforcing the laws to protect rainforests would get higher priority if viewed from the angle of possible destruction of the world's fisheries and the resulting global economic impact? In conservation it's true that "people protect what they love." Therefore it's paramount to inspire people to love wildlife so they will protect it; no matter whether it's the largest whale in the ocean or the smallest insect in the rainforest. In a world where ecosystems are intricately connected, like the rainforest and the ocean, what they love will not be the only thing they protect.